Can any meaning be found in pain, loss and suffering? Written in a highly readable and thought-provoking style, Joel Freeman encourages readers to seek a greater understanding of their feelings of loss and grief through personal reflection. He also prompts discussion about their expectations of themselves, God and others. This book is not filled with glib answers, which serve to drive honest strugglers into deeper disillusionment. Drawing on his years of experience in counseling people through their grief and suffering, Dr. Freeman provides a framework upon which can be found true, lasting peace and security. 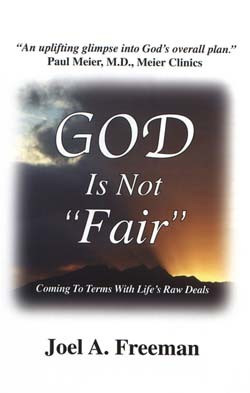 Endorsed by Joni Eareckson Tada, Billy Graham, Paul Meier and others, "God Is Not Fair" presents helpful insights, poignant stories and touches of humor in revealing a biblical perspective on these questions. You are about to embark upon a remarkable journey. "God is not fair -- joel freeman -- jennifer rothschild -- Gid is just not fair -- freeman publishing -- suffering -- hospice -- pain -- author"